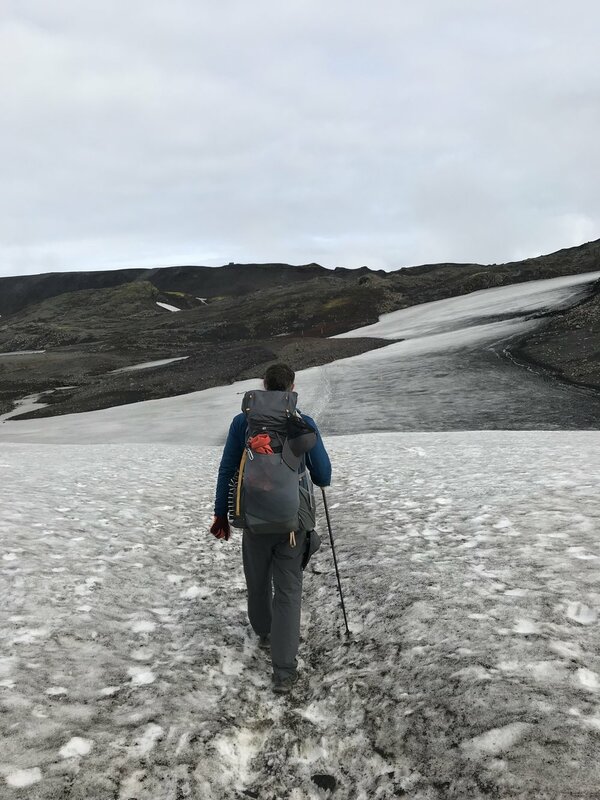 Last August I spent 4 days hiking the Laugavegur Trail in Southwest Iceland with my partner, Don. We had both been to Iceland before, so we had a pretty good idea of what to expect — rain, wind, cold, incredible landscapes, and for everything to be very expensive. All of our expectations were accurate, but the scenery in Laugavegur was beyond what we imagined. The diversity of landscape that you can experience in a single day is incredible and unlike any other place I have been. 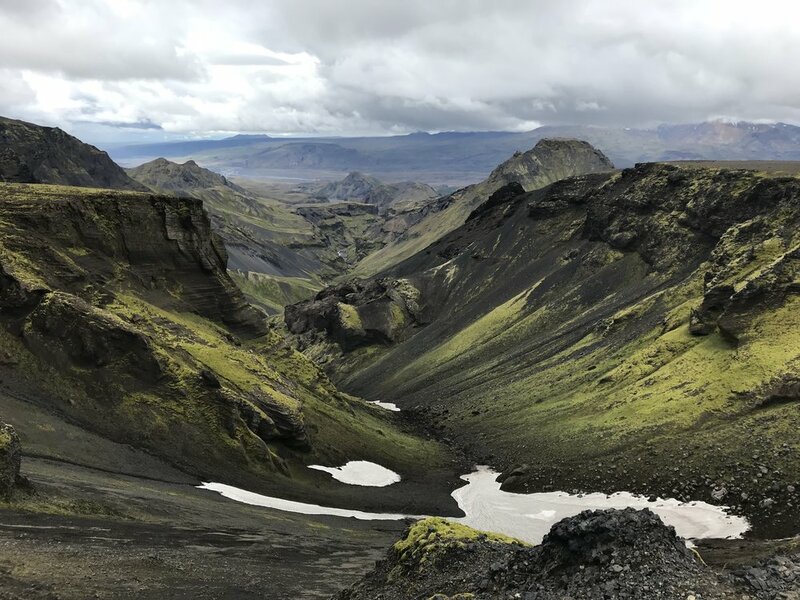 There are no required permits for hiking the Laugavegur Trail (as of 2018), but we did need to plan our route and reserve our bus tickets in advance. 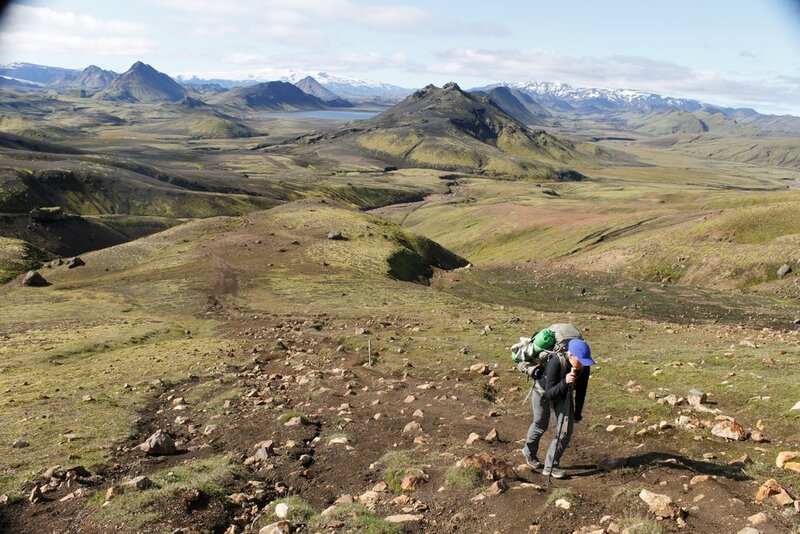 Most people hike North to South, starting in Landmannalaugar and ending in Porsmork. We wanted to tack on a day from Skogar to Porsmork and preferred ending at the Landmannalaugar hot springs, so we ended up hiking from South to North, beginning at Skogar and ending in Landmannalaugar. We booked our bus tickets from Reykjavik to Skogar for the same day that we arrived in Iceland. Luckily there were no flight delays and we were able to skip into town, store a bag of clean clothes at the hostel we had booked for our return to Reykjavik, purchase some eggs, and track down gas for our pocket stove. (We ended up finding a few cans of leftover gas at the hostel. Thanks to whomever left those!) We brought most of our food with us from the States (dehydrated meals, dried fruit, peanut butter, chocolate, and salty snacks). The 25 km/15 mile hike from Skogar to Porsmork, also known as the Fimmvorouhals Route, was challenging but stunning. We hiked past waterfalls, over glaciers, and ended up in a lush green valley — all in a single day! It was a long day, but we were so glad that we extended the trek to include that section. 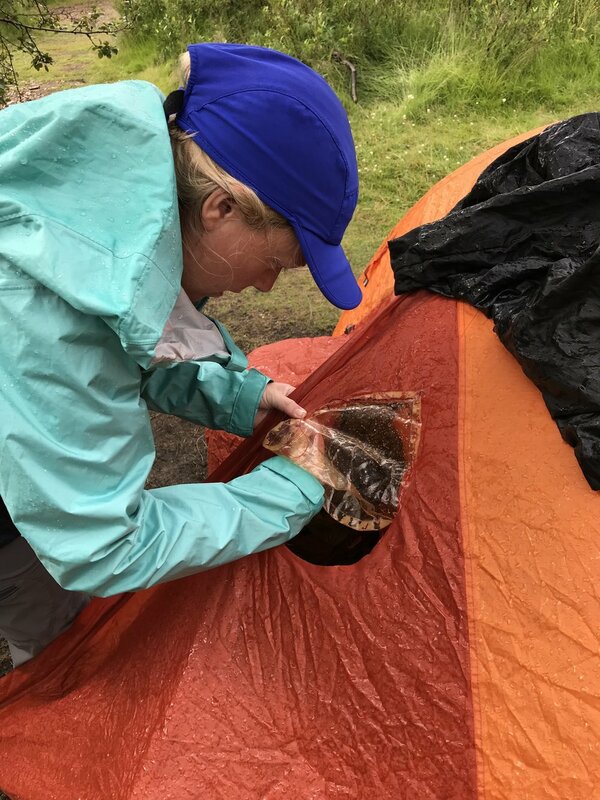 There are mountain huts along the Laugavegur Trail where you can cook and use the facilities, or pay for a bed and hot shower. If you plan to stay in huts, you should book in advance. We planned to camp and for the most part were totally comfortable sleeping outside in our 2 person tent. On arrival at Porsmork we set up our tent to find that the window had fallen off sometime the night before / that morning. 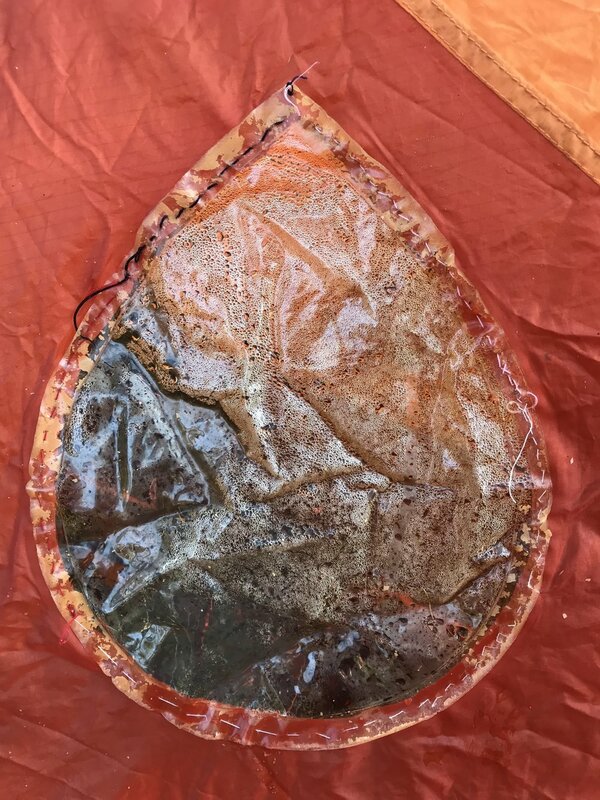 Luckily, we noticed the piece of plastic on the ground as we were packing up that morning, and I stuffed it into our empty bag of pad thai turned trash bag (thinking it was someone else’s garbage). Also, luckily I came prepared with a needle and some thread (thanks Girl Scouts!). I took advantage of the facilities available at Porsmork and enjoyed a 3 minute hot shower for $5. Since Porsmork can be reached by bus or 4 x 4 it has more facilities than any of the other mountain huts. There was even an indoor area with picnic tables where we would cook, eat, and hang out with other hikers. We both agreed that if we were to return we might spend more time exploring Porsmork. From Porsmork we hiked 16 km / 10 miles to Emstrur. We took our time, stopping to admire the views along the valley. We had our first river crossing this day. I was not a believer in the necessity of trekking poles until this trip. Fortunately, Don got a nice pair of super light Gossamer Gear trekking poles last year and was generous enough to share one with me. 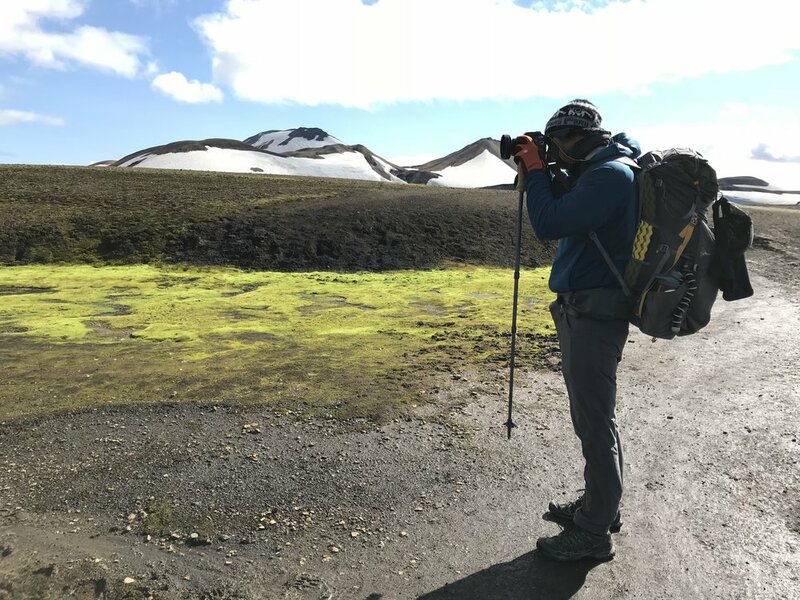 If you plan to do the Laugavegur Trail, I suggest you at least rent or borrow a pair of trekking poles. 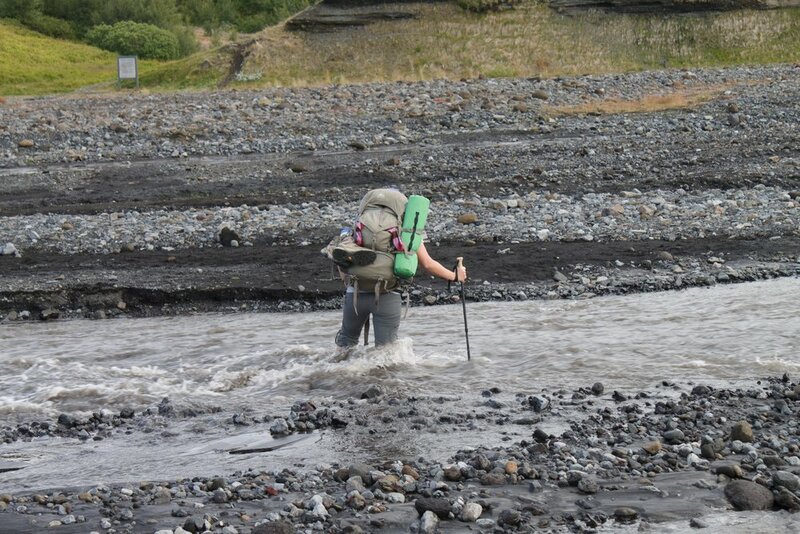 I found even just one pole was helpful when crossing the rivers (which were no deeper than my knees). We really took our time this day, in part because there were really nice views and we were pretty worn out from walking 15 miles the day before. View on the walk from Porsmork to Emstrur, just after the first river crossing. We arrived at Emstrur in time to grab one of the few remaining flat tent spots. Camping is restricted to the area around each mountain hut and costs 2000 ISK / 15 USD per person per night to camp. We noticed that other campers were putting rocks along the outside of their tents, so we did the same. We were glad we did because it was extremely windy that night and the rocks helped to shield us a bit and kept our tent from flying away. The 15 km / 9.3 mile hike from Emstrur to Alftavatn felt much easier than the previous 2 days because the elevation gain was significantly less. However, we had the worst weather of our trip on this day. We were pretty positive about it though because we had been expecting wind and rain every day. We stopped at Havanngil Hut for lunch and were disappointed to find the hut was closed for cleaning. There is another river crossing just before Havanngil and the water left my legs and feet with pins and needles, so we were wet, cold, and hungry at this point. The ranger directed us to the upstairs of a barn if we wanted to eat indoors and dry off. We obliged and hung out with some Czech travelers for a bit as we ate the rest of our peanut butter and pitas (we wished we had taken more). We decided the weather wasn’t getting much better, so we slipped back into our wet clothes and continued the remaining 4 km / 2.5 miles to Alftavatn. We probably looked hilarious trying to set up our tent with the wind whipping about at 35 mph. We managed to get it set up and secured and both decided to splurge on hot showers. After our showers we retired to our tent for a few hours inside our sleeping bags. When the weather cleared up enough we decided to venture out and see what was on the menu at the teeny tiny lakeside restaurant. We were delighted to find a warm, cozy cafe with sweet treats and even full meals. We were on a pretty strict budget, but were happy to pay $12 for a can of beer just to be able to sit in a warm, dry space. We met some fellow Americans, a family of 5 with kids between 9 - 13 years old who were hiking the opposite direction. The kids seemed to be enjoying themselves, though they were all snuggled in pjs and eating chocolate muffins at that point. The weather continued to be pretty wet and windy throughout the night, but we managed to sleep well enough since we were worn out from hiking. When we woke up though the weather had totally cleared and we got to enjoy a nice sunny breakfast by the lake. After a leisurely breakfast and some sun which helped dry out our clothes, we headed out. It was a gentle climb for the first few miles, with a smaller river crossing. We took water sandals for the river crossings. I considered taking flip flops to save weight, but that would have been a bad idea as sometimes the river is a bit swift. I suggest a pair of water shoes or sandals that strap to your feet and have good traction on the soles. 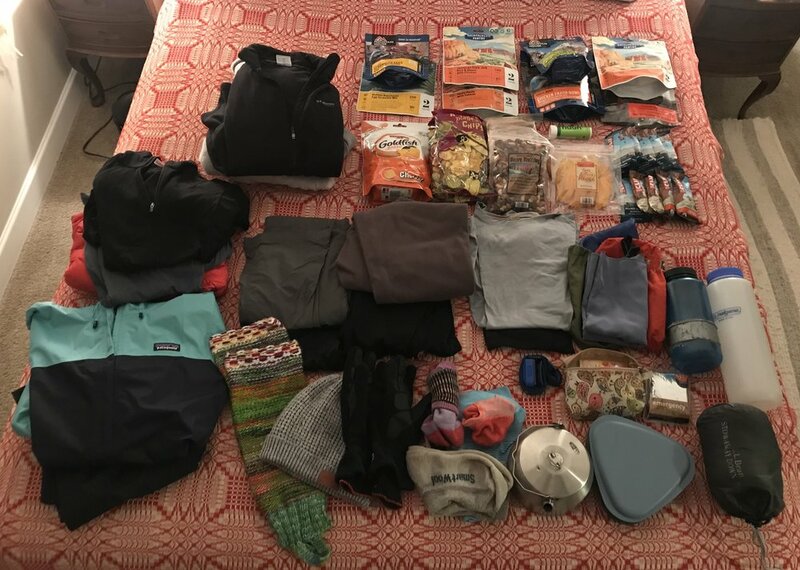 See the end of the post for a detailed packing list. There is a long climb out from Lake Alftavatn, but a stunning view! When we reached the top of the big climb, not only were we rewarded with this stunning view of the lake, but we also saw what lay ahead - steaming sulfur pools bubbling up from the ground, neon green algae growing on volcanic rock sprinkled with snow. It felt like we had stepped onto another planet! 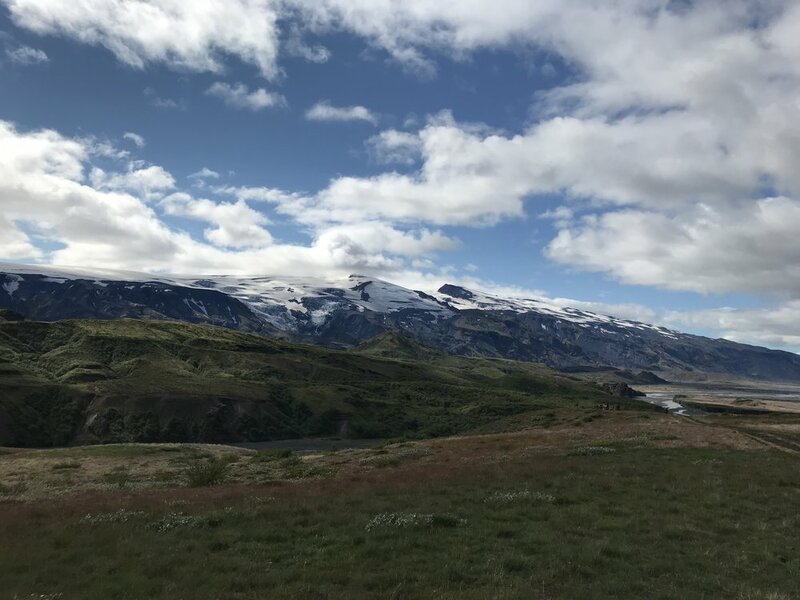 We had planned to hike just to Hrafntinnusker from Lake Alftavatn 12 km / 7.5 miles, but when we arrived at Hrafntinnusker the ranger suggested we continue on to Landmannalaugar (another 7.5 miles). There are not many facilities at Hrafntinnusker and it is right on a sandy ridge which tends to get a lot of wind. We heard from other trekkers coming the opposite direction that it was not a very comfortable night’s sleep. We took everyone’s advice and continued on to Landmannalaugar. The 15 miles this day would have been more difficult had it not been our favorite day of the trek. There is no other way to describe it than otherworldly. We hiked up and over mountains, past geysers, hot springs (too hot for swimming), and over another glacier. It was truly incredible. My dogs were barking pretty loudly by the descent into Landmannalaugar. Knowing that a hot spring was my reward helped me to persevere, and oh what a sweet reward it was! After a soak in the hot springs and one more dehydrated meal, we zonked out. Our bus didn’t depart until after lunch the following afternoon, so we slept in, took another dip in the hot springs and had lunch before boarding the bus back to Reykjavik. Don’t forget to pack out EVERYTHING you bring in! Try to avoid going #2 outside. There are toilets at the huts. Follow the guidelines, listen to the rangers, and tread lightly. Have a gap year, career sabbatical, or general travel question?